If your store sells products that are too large or heavy to ship, your customers may need to pick them up from your store or another physical location. Designating those items as non-shippable ensures that no shipping fees will be charged for those items, while also informing your customers about any special shipping circumstances. Visit Settings > Config Variables and click Search. Type the word “shippable” in the Name field and click Search once more. Select the checkbox for the “Allow products to be marked as non-shippable” config variable. Voilà! Your store now supports non-shippable products. From the Inventory > Products list, select a product record to edit it. Under the Advanced Info heading, locate the Shipping section and scroll to the bottom. Below the NonShippable checkbox, you’ll also see an “Edit Nonshippable Item Help Article” link. Clicking this link will take you to a page where you can customize the customer-facing message that describes how non-shippable products work. For more information, see "Non-Shippable Message on the Product Page" below. 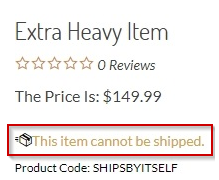 The purpose of the non-shippable product feature is to make customers aware of the shipping limitations for certain items, while still allowing them to be purchased. For that reason, it’s important to provide plenty of indication when an item can’t be shipped. Read below for details on letting your customers know about these shipping exceptions. When an item is non-shippable, customers see a “This item cannot be shipped” message below pricing information. Any free shipping messaging will be hidden, as the non-shippable status overrides that setting. If you want to change the wording of the hyperlinked page text (“This item cannot be shipped”) or the explanatory text that appears in the pop-up modal, you can edit those pieces from your Admin Area. Below the NonShippable checkbox on any product editing page, click "Edit Nonshippable Item Help Article". Click on the article ID number to edit the Title (hyperlinked text on product page) and Body (pop-up message). You can also get to this page by visiting Design > Site Content and performing a search for "shipped" in the Article Title field. When a product is flagged as non-shippable, the product’s weight will be omitted from live rate shipping calculations. Applicable sales tax will still be calculated for the product, as normal. For more information on how non-shippable products function in the cart, see the Notes and Tips section below. In general, processing orders with non-shippable items is much the same as processing standard orders. Marking an order as “Complete” will cause a non-shippable product to be marked as “Shipped”. In the Details section of the Order Details page, you'll see a new Nonshippable column. Non-shippable items are marked with a "Y". Additionally, when modifying the order details in Edit mode, the Drop Ship column will be blank (no checkbox will appear) for any non-shippable items. To locate all orders that contain non-shippable products, go to Orders > Process Orders and click Quick Search. Select the Nonshippable checkbox, then click Search again. You'll see a list of search results that includes all applicable orders. 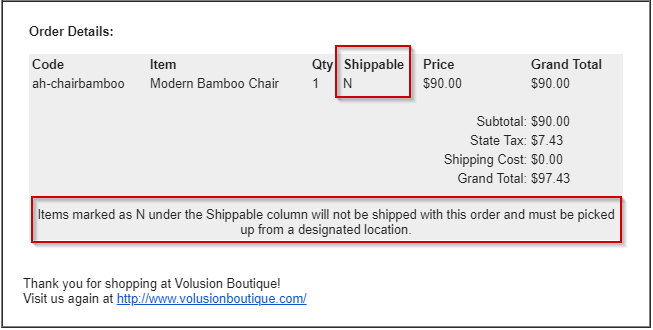 Order Confirmation emails include a Shippable column in the Order Details section. Each non-shippable item is indicated by the "N" value in the that column. To edit the text that appears at the bottom, go to Design > Site Content and perform a search for "non" in the Article Title field. Make edits to article 258 as needed and save.